Nathaniel Jones hoped his first experience in London through the Scott College of Business' insurance and risk management program during spring break would teach him more about the industry and broaden his horizons. "I wanted to travel abroad to expand my horizon of thinking and see how people in other countries lived opposed to us in the U.S.," said Jones, junior insurance major from Indianapolis. "By talking to one of Aon's Lloyd's brokers, I found their jobs to be interesting and competitive and learned a lot of educational material and real examples I can take back into my classes." "The insurance market in London is one of the most robust and active in the world," Wray said "The London market is the world's largest global hub for commercial and specialty risk. The market delivers solutions for risks in almost every country around the world. The world is a very small place and even if you are an ocean away, business is still being done." Students had the opportunity to visit Lloyd's of London - the world's largest independent market and oldest continuously active insurance marketplace; Crawford & Company - the world's largest-independent provider of claims management solutions to insurance companies and self-insured entities; Lockton Companies - the world's largest privately-owned insurance brokerage; Aon Benfield - the world's leading reinsurance intermediary and full-service capital advisor; and Chartered Insurance Institute - the world's largest professional body dedicated to insurance and financial services. "They got to see how transactions are done on the floor, so it exposed students to a different way of doing business," Liu said. "Risks are placed more traditionally, face-to-face over there but it is all still placed efficiently in the world's largest surplus lines market." In talking to a cyber insurance broker at Lockton, Jones said he learned more than he could have gotten from any classroom lecture. "He used real-life examples so it was easier for us to see and understand the material," Jones said. "I feel in my future career I can use this trip as a reference. I can relate to seeing Lloyd's of London for the first time and have a greater understanding of what they do. I can also now talk to others that have visited London and share our experiences as well as the insurance knowledge I received from the trip." It didn't take Jones long to experience culture shock once he got off the plane, though. "I found London to be a fast-paced environment, where no one talked as much as they do in ‘friendly' Indiana," he said. "I learned how to approach someone with this mindset when I was lost and needed directions." The most interesting part for Jones was experiencing the business district's work-life balance. "For the week I was there I saw that most business professionals go to work at 8 a.m. and get off as normal at 5 p.m. But after work it seemed that the majority would go out to eat or go to the bar with coworkers or potential clients, and did not seem to go home until 8 p.m. or 9 p.m.," he said. "They lived and breathed business. Most professionals would put in a 12-hour day, including the dinner after work with client. The interactions were more personal and they wanted to physically meet with people, instead of sending e-mails." 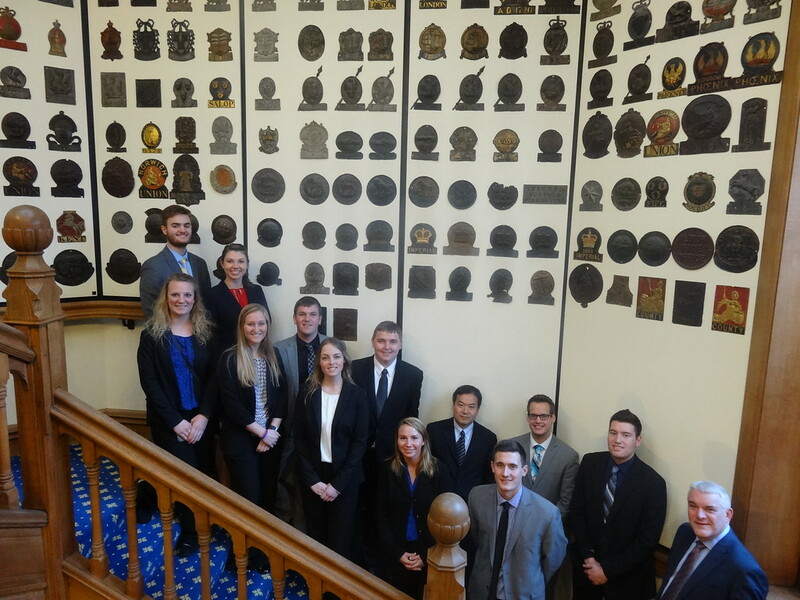 Eleven insurance students traveled to London, March 12-19, to study the insurance market during spring break.